C-Bear is the official sponsor of the Lotto Soudal cycling Team since 2009, providing riders like Andre Greipel and Thomas De Gendt with ceramic bottom brackets and -derailleur pulleys. If a C-Bear bottom bracket is good enough to withstand the Gorilla’s power peaks during sprints, than it is certainly good enough for me. Why C-Bear Bottom Brackets ? My Canyon Ultimate CF SLX is equipped with a Shimano BB92-41B Pressfit 86,5 Road bottom bracket. The plastic cups of this press-fit bottom bracket started to release from the frame, providing 1 or 2 mm. between the cup edge and the frame. 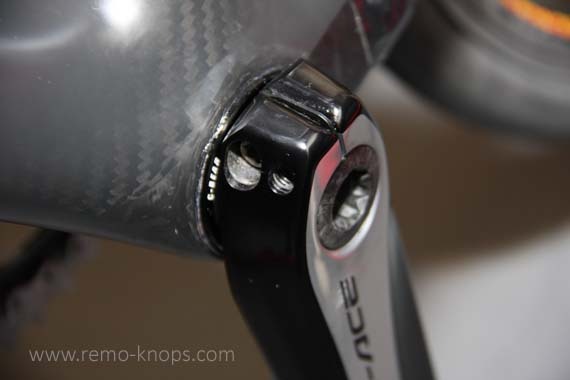 I’ve search online and stumbled on James Huang BikeRadar article “I’ve had it with press-fit bottom brackets” in which he covers tolerances, used materials and silencing creaky noises. Two major take aways …. So I was looking for a solid ceramic bottom bracket with aluminum cups for a good price-point. Chris King and Ceramic Speed are well known, and technically solid, but pricy. A cycling friend of came with C-Bear and I decided to do some online research and contact founder Bart Schouten. Third Bart Schouten and his team are very customer friendly, providing you with good advice. If you have any doubts about ordering the correct bottom bracket, simply contact C-Bear. Also the shipping of the bottom bracket was super fast, basically it took two workdays between order placement and delivery. 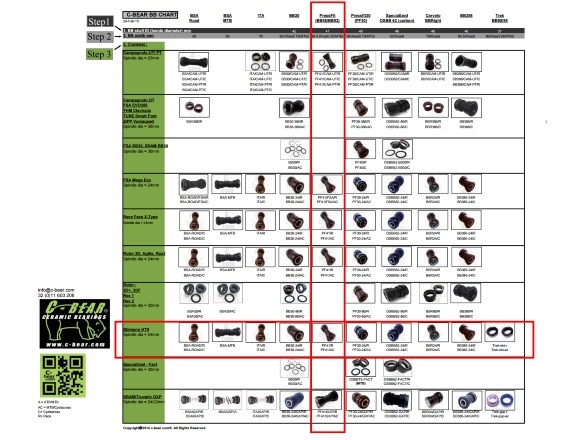 C-Bear has build a matrix with the most important bottom bracket diameters (columns) against the most important crank axle diameters (rows). So if you know the measurements, it is a two step process to get the right C-Bear bottom bracket. When you have the correct type, the third and final step is to choose between usage-type road, cyclo-cross or mountain bike. 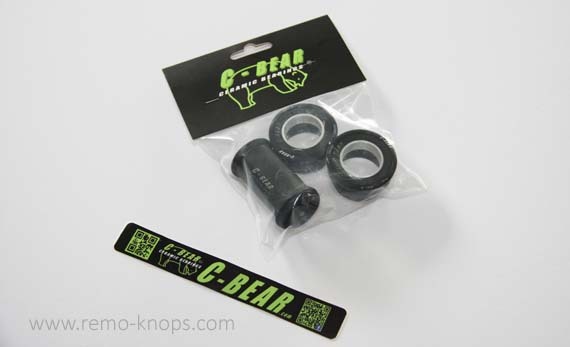 Please have a look at the C-Bear Bottom Bracket Quick Finder to get your C-Bear bottom bracket. Installation of the C-Bear bottom bracket is very easy, when you have the correct tools. Personally I used a professional bearing replacement tool – SRC-TT-B006C to drive out the old press fit bottom bracket bearings and the cups. After removal of the old Shimano BB92-41B bottom bracket I cleaned the bottom bracket area. Than I applied some Morgen Blue Aquaproof Paste, just like the Wanty-Groupe Gobert mechanic, and pressed in the new C-Bear Bottom Bracket. The replacement felt right to do, the aluminium cups fit tight against the frame and look very solid. Turning the bearings with your finger gives a really smooth and low friction movement (especially in comparison with the old bearings). If you are looking for replacing your current bottom bracket with ceramic bearings than you simply can’t go wrong with C-Bear. C-Bear sponsored teams compete on World Tour level, with Lotto Soudal and Wanty Groupe Gobert. Bart thanks for the excellent advice and keep developing great bearing products. thanks for the review..do you know by chance what the weight is? I did not weigh the bottom bracket before installation. But let me reach out to C-Bear to see if I can get an accurate weight. 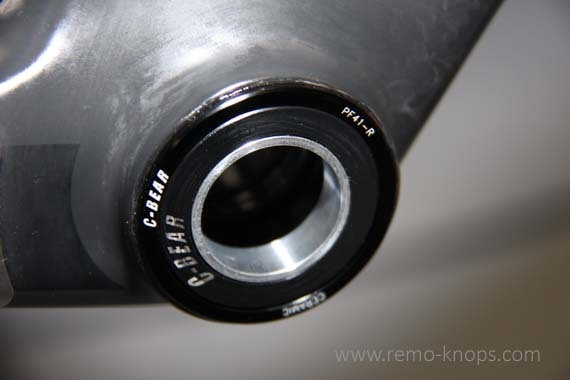 Bart from C-Bear confirmed to me that the complete C-Bear PF-41-R Ceramic Bottom Bracket (including aluminum cups) is just 88 grams. Hey!, I found this information for you: "C-Bear Bottom Bracket for BB86/BB92". Here is the website link: https://www.remo-knops.com/5417/c-bear-bottom-bracket-bb86-bb92/. Thank you.